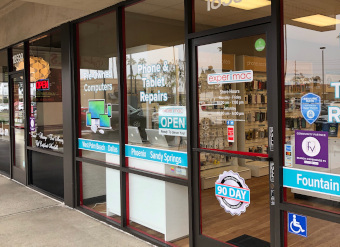 With over 20 years in the data recovery industry, Secure Data Recovery is proud to offer fast and reliable data recovery services in Fountain Valley, CA and the surrounding areas. We specialize in providing our customers with the maximum amount of recoverable data from their device. Regardless of whether the device is a cell phone, computer hard drive, tablet, NAS server, RAID array, or any other type of digital media, our local engineers in Fountain Valley can get your data back. With the help of our state of the art technology, our expert engineers in Fountain Valley, CA can quickly recover your data and get your drive back to you, so you can continue business with little downtime. Our office in Fountain Valley, CA has and A+ Better Business Bureau rating. As a matter of fact, all of our offices across the country are accredited with the BBB with an A+ rating. This is a direct result of the outstanding results and customer service. Secure Data Recovery is also the most certified data recovery company in California. We take the security of your personal information seriously; which is why we developed stringent data protocols that will ensure your data is secure. We are also TRUSTe Certified, D&B Verified, SSAE 18 Type I,II, and III Certified, a GSA approved contractor, and follow PCI security standards. For more information about all of our certifications, call our local Fountain Valley office today. Device failure can be sudden and unforeseen. Most individuals are not prepared for a data loss situation and often when a data loss situation occurs it comes as surprise. If your device is making unusual sounds, clicking noises, or overheating, etc., shut the device down immediately. These can be the first signs of device failure. Shutting off the device can prevent additional data loss. Do not attempt to recover your own data. Often times this can permanently delete data and cause even more damage to the device. Our engineers are experienced and have recovered data from thousands of drives. Call our support team for a free device diagnostic. Our engineers will quickly find the source and develop a solution. Call our customer support team today. They will help start your risk free case and provide answers to any questions you may have. The worse thing happen in my life is my hard drive stop working all the sudden and I did not backup my hard drive at all. My whole life is in the hard drive! I spent a day searching for a solution and luckily I found out there are data recovery companies that can help me recovering my data. And out of all those companies, I chose Securities Data Recovery based on their super good review, and I am glad that I made a right choice. Ryan was the one I talked to and he provided me a lot of good information over the phone. And Mitch gave me confident about the company. I drop off my hard drive to them and took about 19 days to recover my data almost 100%. Some reviewers complaint they are kind of pricy but to me, it definitely worth it. There is some cheap data recovery for $few hundred only but I would not trust those companies at all. Securities Data Recovery is professional; I believe that they treat your data confidential. I highly recommend this company to whoever needs this service. Ryan at Secure Data helped my company retrieve a important production related folder, with test results. He followed through every step of the way, from the moment he received the hard drive, until I needed a copy of the invoice. Great service and results! Jeff at Secure Data recovery was amazing! Super clear and forward about the process and helped me with a quick turnaround. We had audio on formatted SD that he was able to pull from nearly a month back! Truly amazing and helped me out in a pinch.